Unifies the complexion of the skin. 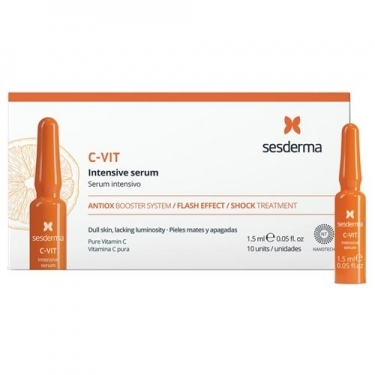 DESCRIPTION: C-VIT Facial Intensive Serum Flash Effect Ampoules from Sesderma is a shock treatment. 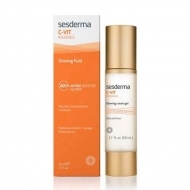 Ideal for dry and aged skin, with excessive exposure to the sun and / or for tired skin without vitality and luminosity. It also helps the skin that has gone through aggressive cosmetic and dermatological treatments (chemical peels, microdermabrasion, ...). Vitamin C (ascorbic acid) exerts a complete anti-aging action: involved in the synthesis and repair of the dermal collagen, helping to regenerate the extracellular matrix, hardening the skin and providing greater softness and elasticity. 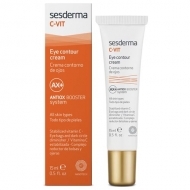 Protects against free radical damage and harmful effects caused by UV radiation (erythema, redness). It unifies the complexion of the skin, because it interferes with the synthesis of melanin. Massage gently with your fingertips until completely absorbed.